Though the Reverend Dr. James Naismith, inventor of Basket Ball, passed away long before anyone referred to the NCAA Division I Basketball Tournaments as “March Madness,” it seems likely he would have enjoyed our nationwide party of college hoops. Dr. Naismith was not just “a medical doctor, Presbyterian Minister…and owner of a vocabulary without cuss words,” as his friend, the legendary football coach Amos Alonzo Stagg, once wrote.1 He dreamed new things. And what is madness, in March or any month, if not a dream-like vision of the world? His youth in Almonte, Ontario, Canada, had elements of nightmare. His parents died of typhoid fever when he was nine years old, and his brother succumbed to an abdominal infection when James was a student at Montreal’s McGill University. The memory of those losses, and the religious education he received while studying for the ministry at Montreal's Presbyterian Theological Seminary, shaped his resilient character, as did his outdoor exploits as a lumberjack, rugby player, and football lineman. The Old and New Testament virtues of determination and compassion coexisted in him to an unusual degree. Mr. Stagg—himself a Presbyterian proponent of the “muscular Christianity” movement that encouraged young people to develop in tandem their physical and spiritual selves—said Naismith the lineman could do “the meanest things…in the most gentlemanly manner." Many credit Naismith with inventing the football helmet while teaching at the International YMCA Training School in Springfield, Massachusetts (now Springfield College). The safety of Basket Ball players was certainly on his mind in 1891 when he set down the 13 rules of his game, invented to promote indoor exercise among students during New England’s coldest months. Rule Number 5 states, “No shouldering, holding, pushing, tripping, or striking in any way the person of an opponent shall be allowed.” Even the method of scoring, arching a soccer ball into a peach basket fixed high on the wall, protected teammates and opponents from errant shots. No dribbling was allowed in those early games, nor flagrant fouls. In the YMCA Training School’s gym, any player who touched another with the “intent to injure” was immediately ejected. In Springfield, Naismith coached his future wife, Maude E. Sherman. The two moved to Denver, Colorado, in 1895 so Naismith could complete his physician studies at Gross Medical College. Their last home was Lawrence, Kansas, where Naismith became the director of the gymnasium at the University of Kansas in 1898 and soon started the school’s storied men’s basketball program. Though the only Jayhawk coach to retire with a losing record (he often spent more time refereeing games than coaching his teams), the chapel services Naismith led before hundreds of students, and the guest sermons he delivered at the First Presbyterian Church in Lawrence, were hugely successful. When some church members objected to a Sunday School game he invented where students combined Bible and baseball stories, Naismith took his newest creation on the road as a visiting minister, preaching the gospel of sportsmanship at other churches in the Midwest. Not coach or win… but pray. Let’s hope the men’s and women’s teams in this year’s tournaments are as brave in loss and as humble in victory as the visionary reverend doctor. 1. Swade, Josh. 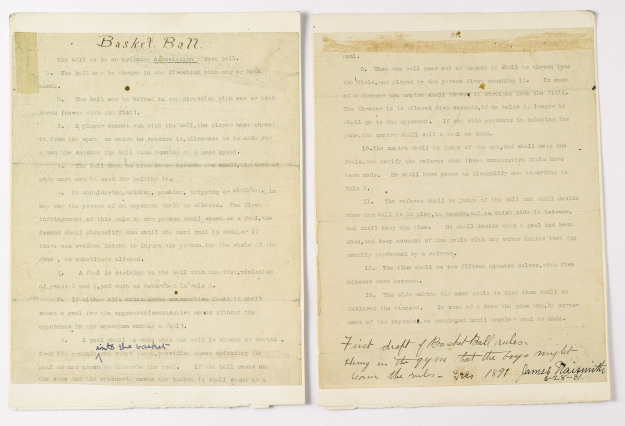 The Holy Grail of Hoops: One Fan’s Quest to Buy the Original Rules of Basketball. New York, NY. : Sports Publishing, 1990. 2. Rains, Rob. James Naismith: The Man Who Invented Basketball. Philadelphia, PA : Temple University Press, 2009. 1 hour 41 min ago. Happy #EarthDay from the Presbyterian Historical Society! Here is an image of the very first Earth Day in 1970 that comes from our collection of Religious News Service photographs. To view this image and read about the Presbyterian Church and it's involvement in environmental causes over the years, visit https://buff.ly/2GznHvN.